Lord I place mrc into your hands I place a wall between mrc and ma wall between Mrc and ns. Lord I place the director onto your hands. Give him courage. Give him direction to stamp out wronddoingBless him walk wirh him. I pray for healing, or at least a day within pain. I pray for healing for my oldest daughter, to bring her the help that she needs. I pray for my younger daughter, with her new career and with her relationship with her boyfriend. I pray for my Dad & Mom, that they also may continue with happy healthy lives. I pray for my brother and my sister, that they will accept You again into their lives. I pray most of all, Dear Christ my King that I may live, show and bring to all my family, friends and everyone that I am around that You are Christ the King, Savior of our world. A caring King, giving freely the gift of grace, love, hope and peace to all who trust in You and give allegiance to your Holy Name. 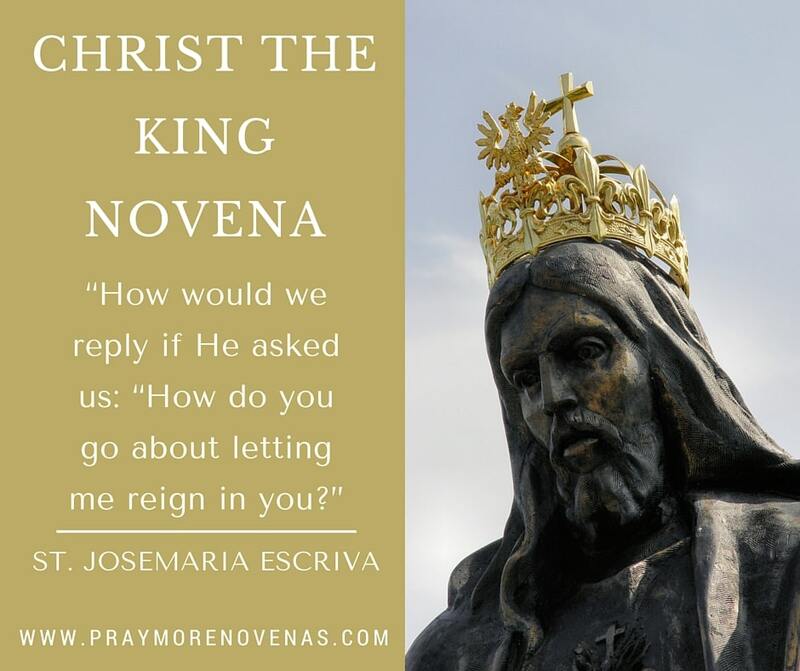 Christ the King, hear our prayers for our family members and friends. May your will be done in all matters! May my brother in law, his daughter solution their transportation problems. Money is tight right now, and may my brother in law get a better job with more hours. Pray for my brother in law to continue to trust God. Pull Brian out of his depression. Pray for conversion of commitment in the faith of trusting God more in our homes, extended families, in our communities and throughout the world. Especially praying for those individuals in a position of power, may they be guided by the Holy Spirit, and be transformed. Give me the Grace to do works of Mercy and Apostolic works in my community. I offer all my works up for the Poor Souls in Purgatory. Guide my husband and myself so that we can get all our preparations done in an orderly fashion. Pray that my husband has a fervent heart to serve you. I pray to know God’s will for me. I pray for the strength and guidance I need to accept His will. Thy will be done. In Jesus’ name. Amen. Please pray that I revere God at all times. That God grants me the desires of my heart. Please Lord show favor on me. I pray to you and surrender myself to your Holy Will. I pray for continued healing physically, emotionally, mentally and spiritually. I pray that a good Catholic man will come into my life, for future security and financial resources, for a supportive network and for a couple good friends. I pray in thanksgiving for a breakthrough with Erin and for continued healing and conversion. For Ryan, for help in his studies and work, that his dreams will be fulfilled. For the souls that I know. For all those that I pray for. I pray for your intervention directly in my special intention and for Fr. Joe’s strength and courage. For protection for my family and especially the children. I pray for my wife to stay in RCIA and convert. I pray for my daughter in laws, father as he has serious health issues. I pray overcome my fears and to be free from needless worry. I pray to be free from worry of health issues. Pray for guidance in changing jobs. I pray that my business continue to be in the hands of the almighty. I pray that the business will be blessed together with the clients, the workers and myself. Thank you Jesus. bringing our Granddaughters for Baptism. I also Pray that my Marriage may be strengthened. sick or suffering in any way. end the conflict with Korea. Help for Jausha in his healing from cancer and peace for Ann his mother. Christ the King , heal me and make me whole. Christ the king, help me as i undergo surgery tomorrow. I pray for healing. May your will be done. O King Of Kings, if it be Your Will, You can make me clean. Please make me clean from every sickness and hardship, ???? Christ the King,I pray for my family’s health & financial problems under your tender care…Pray for my own health’s problem….Pray for my friend -J’s intentions…….and peace & harmony in the world….